Choosing the right frame for your child’s glasses can be a challenge. Children are hard on glasses so it’s important to get sturdy frames. Style is also very important. 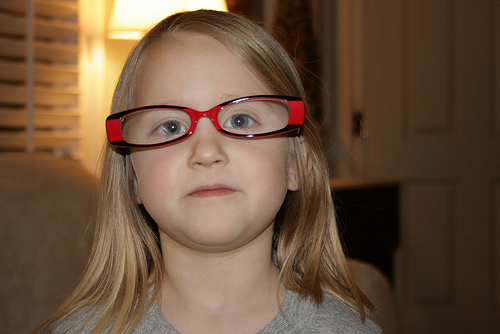 Young children tend to be self-conscious if they have to wear glasses. It’s important they get a pair which looks good otherwise they may not wear them consistently. Also consider the weight of the frames. If they are too heavy they may fall off or the child may take them off when they play. The right temple style is also important. The right ones keep the glasses in place, are flexible, lightweight and wrap around the temple. If you let the child have some input in the choice of glasses frames together you should be able to find a pair which satisfies both of you. Children need the frames of their glasses to be durable. Many children’s eyewear experts recommend metal frames. Plastic frames may be less expensive, but they break so easily you will actually save money by paying a little more for memory metal frames. These frames are flexible and durable. They can take the punishment children put their glasses through and hold their shape. They are also lightweight, resist corrosion and are hypoallergenic. Plus they come in a great array of colours and styles your child is sure to love. While parents may focus on the durability of the frames, most kids want style and comfort. Get a pair that looks and feels good to the child. Let them help to pick out the frames. Glasses can only help your child’s vision if they are worn regularly. Most children will not willingly wear ugly glasses. That is why it is important to let children tell you which frames they like and you work together to choose one of them. The right temple style is also important. It helps to hold the glasses securely in place so children can have the freedom to play. The frames wrap comfortably around the temple inducing the child to keep them on. This makes cable temple frames an excellent choice. They wrap around the ear and keep the glasses from sliding down your child’s nose. They also help to prevent the glasses from falling off and breaking. They are harder to put on and take off, but with a little practice your child will soon be comfortable handling them. Consider getting a pair with spring hinges. Choosing frames for your child can be fun if you include them in the process. Visit your eyewear professional together. Let you child try on as many pairs as they like until they find one that looks and feels right, and pray they will keep them on.